Can a Polluted Past Have A Future? Real estate in Ithaca is fairly warm as markets go (I refuse to call it hot). But there are still some gaping issues in the metro market. One of the biggest examples is one that can be seen from just about any southward vantage point above the lake lowlands – Emerson Power Transmission. The property started as Morse Chain, which dates back to 1880 and began the manufacture of automobile chains in 1906. Morse Chain was acquired by locally prominent BorgWarner in 1929, and the facility continued industrial production until BorgWarner built a new facility near the airport in 1983, selling the factory to Emerson Power Transmission. Throughout the 1960s and 1970s, several chemicals were used for “cutting oils”, removing oils from the manufactured automotive gears, shafts and chains at the tail end of the process. One of those was trichloroethylene, or TCE. TCE is a known carcinogen, and I’ll come back to this in a moment. Unfortunately, the era of traditional manufacturing was fading in the Ithaca area. Emerson Power Transmission moved about 55 of its corporate senior staff to a suburban Cincinnati facility in 2007 (and I remember reading about it while a student at Cornell). The death knell came in August 2009, when Emerson announced it was closing up shop in Ithaca, putting 228 people out of work (the factory had over 500 people on site as recently as the mid-2000s, and had received tax incentives not long before closure). The closure was recent enough that this blog was already going, and the original entry is here. At first glance, the property would appear to be potentially salable. It’s a large property in a well-populated and growing area with a substantial uptick in the real estate market. However, there’s one very, very big issue – the TCE contamination. Although TCE use stopped by the late 1970s, the damage was done, and unknown quanities of it leaked into the groundwater and sewers. The site was declared contaminated by the state in 1988. Since then, it’s been a series of long and contentious debates about who to hold responsible for what degree of clean-up. The city, the state DEC, and BorgWarner and Emerson had volleyed back and forth on who pays for what. 35 years after the chemical usage is stopped, yet nearby sewers have had to be replaced, soil tested constantly and excavated if contaminated, and groundwater / vapor testing in nearby properties. Essentially, a major environmental headache. Although the brunt of the burden has fallen on government and Emerson to clean up (BorgWarner gets blame but seems to carry little if any of the cleanup cost), the site has been marketed for sale – $3.9 million for 94 acres plus structures (note that just the groundwater is contaminated, not the structures themselves – this isn’t Ithaca Gun). It was no surprise that with the remediation and continual testing, the site has been a tough sell. All the more interesting, then, that the local chamber of commerce announced at a recent luncheon that someone is agreeing to purchase the property. Emerson’s in the final steps of reviewing the offer. The property could be host to a variety of activities – the IJ article mentions a possible small business incubator like the one at the South Hill Business Campus (itself a former factory). Given the location, any number of industrial or commercial applications are possible, maybe even partial/total tear-down and redevelopment. 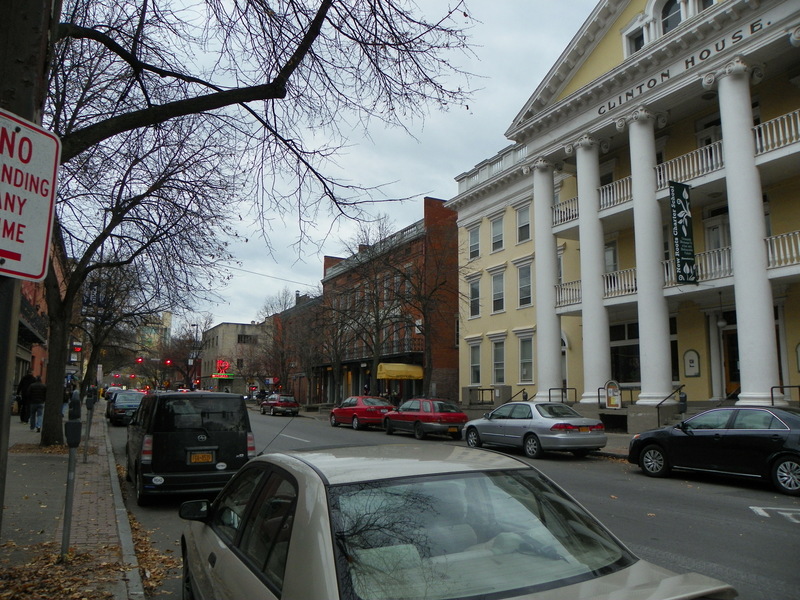 The biggest obstacle apart from the lingering environmental concerns might be the fact that the property is split along the city and town of Ithaca, so both would have to accept any proposed redevelopment. But still, any progress on the looming, decaying facility would be one of the surest signs of a “reinvention” of the area. The Humanities Building has a name – Klarman Hall. The building is named for Seth Klarman ’79, a prominent hedge fund manager and large-scale investor in pro-Israel organizations. Considering the construction cost is at least $61 million, Klarman probably put up at least half of that amount. A part of me wonders if there’s any cruel humor to be had in an investment banker with strongly pro-Israel views funding a humanities building where most of the students who will walk through those doors will hold an adopted dislike of him (due to his strongly capitalist tendencies, and Israel being an easy target for disdain given the conflict with Palestine). For what it’s worth, Mr. Klarman does keep a very low profile, and is considered fairly conservative as investors go. 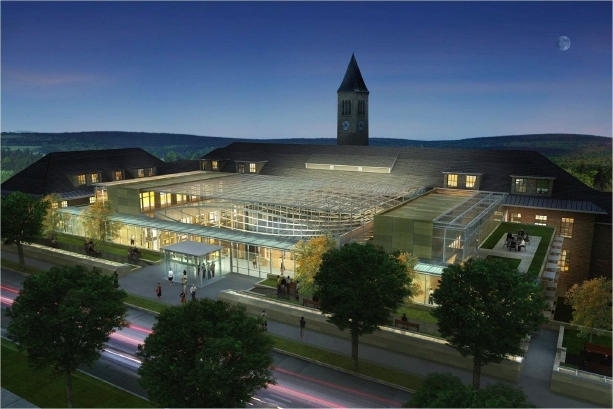 Klarman Hall, which I have previously shrugged off as a token glass box, is set for a construction launch this summer, with completion in 2015. The building is planned to be LEED Platinum with low-energy everything and living roofs, and is designed by Koetter, Kim and Associates, a Boston firm founded by Cornell alumni. In a twist any cynic would enjoy, it was discovered a few years ago that Goldwin Smith, the professor and namesake of the hall Klarman will be contiguous with, was a virulent anti-Semite. I thought about this for a moment. What project do I know that was approved for 106 units and abuts the Black Diamond Trail, and is close to the medical center? It’s not like there were many choices. The project was finally approved last April after jumping through a larger number of bureaucratic loops, mostly because it’s in one of the most rapidly developing parts of the county. 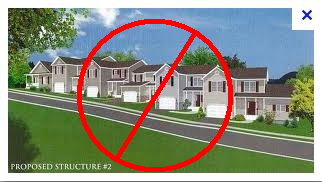 Among the requirements for approval including an unrestricted bus pass for each unit, and that 10% of the clustered one-and-two story townhome units be made affordable. So now, no units, no extra traffic…and no affordable housing, no extra tax income, and rising real estate prices and property taxes for an area that does not have enough supply for demand. At the very least, a waste of time for a lot of stakeholders in the project. For the record, the land, project, and all its approvals, could be yours for a cool $7.75 million. I held off on posting anything last week (opting instead to post early), because of a hectic work schedule. It seems wrong at first glance that a meteorologist should have a day off during what will be by most accounts a powerful snowstorm; but I work weekends and I already hit my OT limit for the week. So seeing as how most of my “weekend” plans are cancelled, here’s a smattering of news tidbits. – 70 new units of eco-friendly housing are planned for West Hill. The complex would be a mixed-income development of townhomes and apartments, clustered for pedestrian ease. Notably in the article, a town councilman asserts that the land was intended for industrial development under the comprehensive plan, not residential, and “it’s not clear to me at this point how it (the proposed housing development) fits in with our overall concept of development in that area”. Fine and all, except the town put the parcel out to bid six months ago with the goal of residential development of an eco-friendly, mixed-income nature. With a starting bid of $500,000. I guess someone ponied up. I also guess there would be a very costly lawsuit if the town tried to change the rules now. But then, this councilman has always been a notable opponent of West Hill development, so we’ll see how this plays out with the planning board. – Funds are in place to purchase property for the construction of Ithaca’s first mosque; the Sun article suggests a small parcel near the mall. Kudos, Ithaca, and best of luck to the future house of prayer. I have every faith in Ithaca’s residents and culture to avoid another Murfreesboro from happening. – An ensemble of small projects form some minor blips on the radar. Two duplexes to built in the Eastern Heights neighborhood. The Palms’s water pipes burst, furthering the building’s inexorable move towards demolition, probably when Novarr-Mackesey’s time frees up with the completion of Collegetown Terrace in 2014. Lansing’s new fire station is near completion, and in a total failure on my part, I had no clue what it was when I took a photo of it in trying to find the senior housing that was supposed to be built with the new BJ’s.